Meng Ding Huang Ya Yellow Tea comes from the misty top of Mt. Meng, Sichuan province. Mt. Meng is one of the earliest tea cultivation areas, dating from 2000 years ago. Meng Ding Huang Ya Yellow Tea has been a legendary tribute tea. Strictly harvested and hand processed, Meng Ding Huang Ya Yellow Tea consists as much as 10,000 beautiful tiny down-covered shoots per 500 grams. Complex and delicate with hints of floral, sweet and nutty. Superbly smooth and full-bodied. 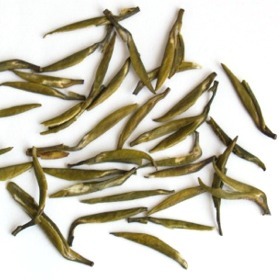 Tender and smooth green tea leaves. We recommend using glass-based or porcelain tea ware. Rinse tea cup and teapot with hot water. Use about 2.5 - 3 grams (approx 1/10 oz) of tea leaves (1-2.5 teaspoons) for every 225ml of water. Steep tea leaves in hot water at 80°c (176°F) to 90°c (196°F) for 1 minute for the first and second brewing. Gradually increase steeping time and temperature for subsequent brewing. A good yellow tea itself being rare, the Meng Ding Huang Ya with its slightly steamy and subtly sweet flavour is a pure pleasure. 90°C and 1 minute proves to be a good basis for discovering the assets of this tea.